DAVID LE/Staff photo. 5/12/15. 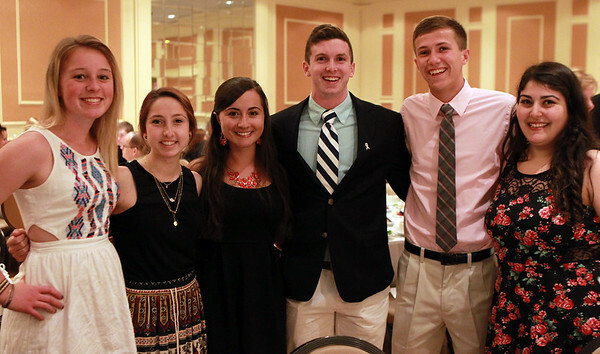 From left: Peabody Veterans Memorial High School seniors Vicky Butler, Caroline Colbert, Jen Anderson, Peter Kilcommons (St. John's Prep), Ben Manoogian, and Gabriela Molica. at the 47th annual Honor Scholors Recognition Dinner held at the DoubleTree in Danvers on Tuesday evening. Other PVMHS receiving recognition were: Sarah Godschall, Nicolas Blaisdell, Fabio Borges, Julia Brown, Felipe Camelo, Ira Ceka, Jillian Connolly, Caroline DiOrio, Riley Dowd, Rita Ejiofor, Devon Forsythe, Nicholas Gilbert, Allison Heuston, Samantha Kinnaly, Jennifer Meeks, Caroline Nazaire, Mary Margaret Sta. Cruz., Lauren Sliva, and Jakob Stenson.